Ok I made the order for the lower and the sba3 kit. Which mags for this? *They prolly put at least one component out of stock when they are having a sale on completed rifles, so you can't buy a complete build while the sale is ongoing..
With the heavy barrel, get the sling ring that goes under the tube so you can sling it over your back when in the field. My 10" is 5# (DI, not piston) but still heavy to carry for a long time. Seems like the shorties come HBAR vs pencil style, not sure why. Flash hider is not needed and just adds weight & $$. 223 mags have side ribs that hold the 223 shoulder back. File down if needed but they really only cause problems with full mags. Pmags now come in BO variety but add a few $$. I use a low mount reflex sight, RD needs to be higher if you want to use the brace as a stock. The ogive on the 300 bullet where it measures.250" should be located at the mag ribs when loading for it. You will love this cartridge; it is a bullet disposal machine. Remember to keep your .300 BO ammo miles away from a 5.56/.223 AR to prevent an accident as most .300 BO rounds will chamber in the .223!!!! With the heavy barrel, get the sling ring that goes under the tube so you can sling it over your back when in the field. My 10" is 5# (DI, not piston) but still heavy to carry for a long time. Thanks for the info, I checked with PSA, the 10.5" is DI. Do you have a part number for the sling? They also say that none of the pistol length rifles or uppers are sold with a pencil barrel. Last edited by DougGuy; 09-04-2018 at 12:58 PM. I have had some issues with some mags using the big 245/247gr boolits. The mags I use that have no issues are Lancer. The Magpul's hang up for me with them. Doug: if you want something from PSA that is listed as out of stock call in and get a number for a supervisor. I did this when I kept asking when 24" uppers would be back in stock. None of the sale people had any answers period! just a bunch of run around. I got ahold of one of the supervisors who went into the back room while I was on the phone and found a 24" upper "blem" which had a miniscule spot on the receiver that missed the anodize and shipped it to me for a $75 discount. This all happened immediately after I finally got ahold of a supervisor. Don't waste time talking to the peons ! Well, thanks for that, I took your advice and got hold of a very nice super in the customer service department, he went and looked, and also went on into the back and talked to the techs that actually do their builds, they didn't have any 8.5" or 10.5" barrels, they were waiting on the barrel supplier and have no idea when they will ship, but he did go and expedite the order for the 7.5" upper that I had already ordered, and he got it shipped out today which was very good of him to do and I appreciated it immensely! Hopefully the brown truck will beat the storm here with all of the necessary parts. Walmart actually had some supersonic 125gr American Eagle and some subsonic 220gr Remington UMC ammo on the shelves so I was able to get 40rds of each, for $60 in total. Not too bad I guess, I have brass, primers, powder, but no boolits. Walmart employees were busy stripping the firearms from the displays and storing them in their boxes, they quit selling firearms when a state of emergency is declared. I guess I was LUCKY to get ammo, I bet tomorrow the ammo shelves are barricaded and have notes posted saying no ammo or firearms sales during the state of emergency. FWIW, I couldn't find any complete upper in 300 BO with a 10.5" barrel length with the 9" mlok handguard I wanted, seems everyone wants that caliber and barrel length all of a sudden. Not only is PSA out of stock, all of the others I checked were out too. I could find them, without a BCG or CH, for the same price PSA sells a complete upper for. Last edited by DougGuy; 09-11-2018 at 09:19 PM. Ive got 4 psa ars now that ive put together with there parts. All are great guns and a real good bang for the buck. Exactly; a fine arm for the money! On my third psa and love them! The infamous Brown Truck delivered the goods, I was able to complete the build before this storm comes rolling in here..
PSA 7 1/2" 300 AAC SBA3 pistol brace, Vortex Sparc AR red dot sight, MBUS Gen2 open sights, Magpul furniture and 30rd 300 Blackout mag. Has the EPT polished trigger and it is crisp and manageable as advertised. Unfired, untested, unsighted, but it's finished, within budget, on time, and barely within the 8lb weight limit fully loaded with 220gr subsonic! MANY THANKS to the fine folks at Palmetto State Armory, and especially to their customer service who expedited my parts so they would arrive before Hurricane Florence arrives! Last edited by DougGuy; 09-13-2018 at 04:21 PM. Nice build you did there. Love their EPT trigger and grab em when they are on sale for $29.95. I have 3 of the PSA lowers that I built and they are good to go. Any interest in a 3 cav (2 PB 1 GC) NOE .311 247 mold? I would trade for some of your services. Welcome to your new addiction! My very first build was a PSA upper on an Anderson lower and it is a very fine carbine. Try 110 grain SuperSonics if you want to see what the little cartridge is all about. You will love it! Congrats Doug! Sorry the 10.5” didnt work out but looks like you have a fine setup there. I blame you and this thread as you as I am back on the psa website looking at the 6.5 grendal...haha! Enjoy and good luck with the storm! 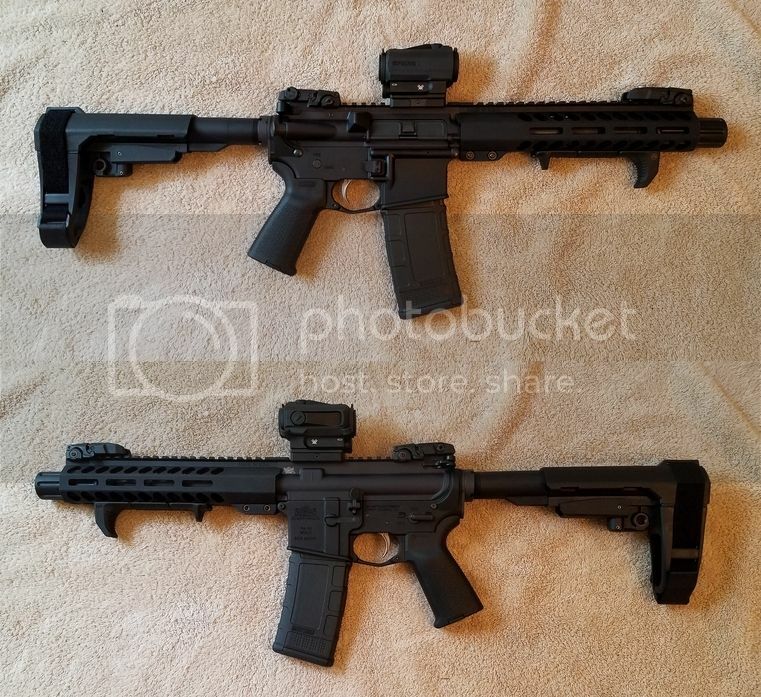 Well I *WOULD* have gotten a 10.5" barrel but........ Somebody was suggesting to build one instead of buy one and the 10.5 uppers are STILL out of stock... So..... Ya gots to do what ya gots to do!! No harm Kevin, I'm pokin ya in the ribs over that one. This is a very close quarters defense arm, in my house, on my property, almost any ammo I shoot will be somewhat over-penetrative so the shorter barrel might be an asset considering this is a residential neighborhood with mostly brick houses. 220gr j-word runs 1015fps out of the Remington test barrel, would that be a rifle? 20" barrel maybe? in a 7.5" pistol length barrel it will be almost on the order of the vaunted old 1911 level of energy, right? Not a dang thing wrong with that either so maybe I have built a gun that manages to squeeze the important parts of the 45 ACP cartridge into a 30rd 30 caliber format. This upper has the same 9" MLOK that the 10.5" has so I can always rebarrel it later but I will probably just build a different one, if I can figure out a job for it that this shorty can't do. How do you like that SBA3 brace? That's real practical, I can use it regardless of where it is set. Thanks! I haven't even shot this one the first time and I already like that trigger. It's stiff but crisp. I can handle that. Not sure I am even going to feed this with cast. I like off the shelf stuff if it's gonna be used for self defense, and I didn't build this one to be a shooter. Break it in, sight it in, load it for bear, and it will sit at the ready until and if needed. Last edited by DougGuy; 09-13-2018 at 08:58 PM. I will just sell the mold. Need to send my 1911 barrel to you. I will get with you when everything is back to normal for you. Interesting, his quote stating the 300 Blackout was developed for 8" - 9" barrels. I am going to have to get QL on this puter so I can look at % of powder burn in a 7.5" as I am planning on using H110 for propellant. I blame you and this thread as you as I am back on the psa website looking at the 6.5 grendal...haha! Enjoy and good luck with the storm! You're gonna hate me even more now, I got email and they have the NiB finshed BCG for $79 free shipping. My bolt is a little rough when it travels so I popped the buy now, can always sell the stock one since it is still technically new and unfired..